Thanks. This is the first time I have used your service and I want to say how delighted I am. Not only cheaper than previous supplier but QUICK!! Ordered on wednesday afternoon, in my letterbox on Friday. Amazing. ACUVUE 2 contact lenses are an improved design on the original Acuvue contact lens, the first disposable contact lens ever made. Made from 42% Polymer (Etafilcon A) and 58% water ACUVUE 2 is an excellent fortnightly contact lens which provides wearers exceptional comfort and handling. 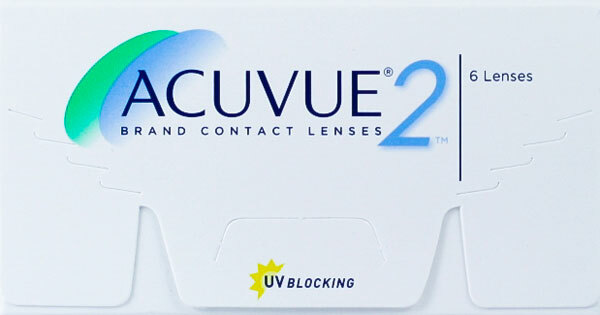 ACUVUE 2 has an improved edge design to provide extra comfort for wearers and a tint for easy handling and insertion. Introduced in 1999 by Johnson & Johnson Vision Care, ACUVUE 2 is still one of the worlds most popular fortnightly disposable contact lenses. If you are looking for a fortnightly contact lens that provides comfort and great value you can not go past ACUVUE 2.